You might have sampled the spicy cuisine of China’s Sichuan region, but have you tried preparing any of its signature dishes at home? Sichuan food is often synonymous with super hot Chinese dishes, (and sometimes, if you’re so inclined, the McDonald’s limited edition ‘Szechuan Sauce’), but this is arguably a misrepresentation of a cuisine celebrated widely in China for its complexity and variety. Sichuan is a province of southwest China. It’s an area dominated by farming, hence why it’s often called ‘the land of plenty’. The area’s cuisine tends to be defined by a strong use of garlic, spice and mouth-numbing hotness (thanks largely to the eponymous Sichuan pepper). Chillies: These are eaten fresh, dried, pickled or fermented. Expect to use lots of Facing Heaven Chillies, which are plump and glossy (chao tian jiao), and long, milder chillies (er jin tiao), which are generally used for pickling and in their dried form. Red Sichuan peppercorns: A key seasoning in Sichuan cuisine, these peppercorns provide a ‘numbing’ effect on the lips and tongue, and are slightly lemony. Doubanjiang: A spicy, salty chilli paste made with fermented broad beans and soybeans. Pickled vegetables: Pickling is popular in Sichuan cooking, and sour, pickled cucumbers are commonly used as an accompaniment to dishes, but you don’t have to limit yourself to just cucumbers. Garlic: A crucial base ingredient for many dishes, don’t scrimp on bulbs. Get to know your wok to perfect Sichuan-style dry-fried veggies – green beans are traditional. They should be cooked with little to no oil, and come up crunchy. Also, master the art of poaching fish in seasoned water – you want the flesh soft, but not disintegrating. Fuqi Feipian: You might rethink your views on offal after tasting this cold appetiser, where slices of braised beef and offal are doused in a chilli sauce. Chuanbei liangfen: A veggie alternative to Fuqi Feipian, this features mung bean jelly and clear cold noodles – with yet more chilli sauce. 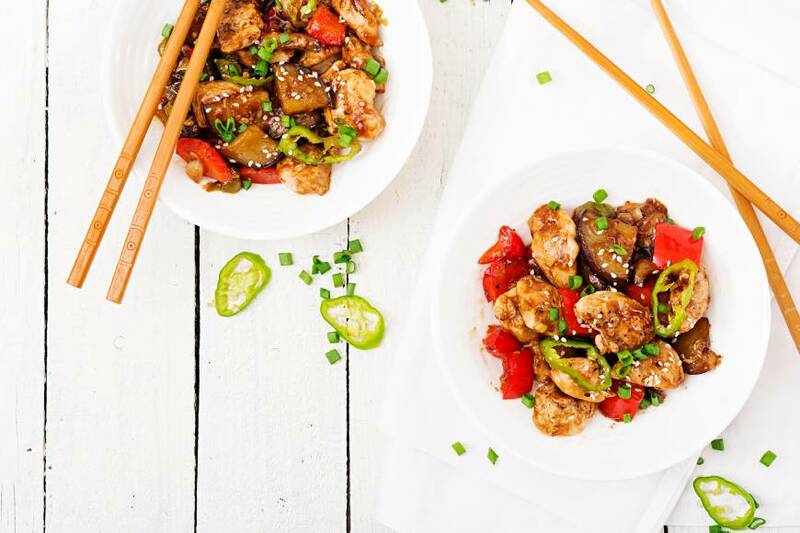 Kung Pao Chicken: Stir fried chicken with chilli, Sichuan peppercorns, peanuts and veggies – this is an absolute classic.